We want to pause for a while to remember and thank all those who have worked over the past many years contributing selflessly to the success of this music festival. To our Gurus and guiding lights. To the tambura artistes, the mridangam and violin artistes and the pakkamelam artistes who volunteer to accompany the devotees’ aradhana. To the poojaris. To the mami-s who do the kolams in the courtyard. To the office bearers. To the long serving trustee members. To the new members. To the volunteers. To the regular visiting artistes. To the sales and marketing teams. To the members of the All India Radio. To the technical staff. To the members of the press. To the people who keep the sabha premises clean. To the neighbouring shop keepers, hotel owners. We offer our sincerest thanks. 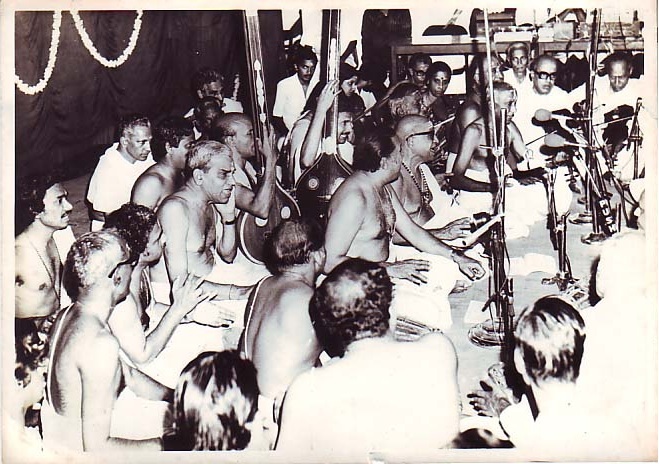 We invite you to share any thoughts, thanks or information you have on people who have rendered any service great or small towards the Tyagaraja Aradhana Trust.